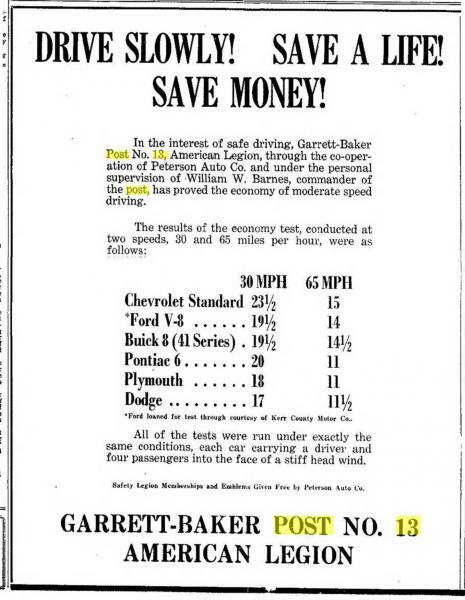 In 1936 the American Legion conducted a safety program which, according to this newspaper account proved that moderate speed driving not only contributes to safety, it is also economical. This fact was proven last Friday by a series of gas tests conducted by Garrett-Baker Post 13, American Legion, through the cooperation of Peterson Auto Company. The tests were in line with the American Legion's safety campaigns, currently inaugurated. The cars were .. under the watchful eye of William W. Barnes, commander of Garrett-Baker Post 13.